If your instance is assigned a public IP address, you can change the address within six hours after the instance is created regardless of whether the instance is in a classic network or in a VPC network. The instance must be assigned a public IP address. To verify the public IP address, view the public IP address in the IP Address column from the Instance List in the ECS console, as displayed in the following figure. If the public network IP address is not assigned at the time of creation of the instance, after the instance is created successfully, you can assign the public IP address by upgrading or downgrading the network bandwidth configuration. For more information, see overview of configuration changes. If the public network IP address is not assigned during the creation of a Pay-As-You-Go instance, after the instance is created successfully, public IP address cannot be assigned. You can only bind an elastic IP (EIP) address. The instance must be in the Stopped status. The instance has existed for less than six hours. Note After six hours, for a VPC instance in a VPC network, you can convert public IP address to EIP address. Instances in the classic network cannot have their public IP address converted. 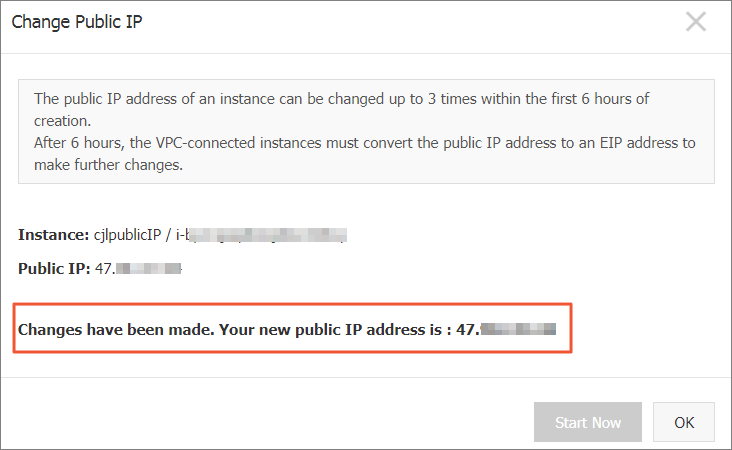 You can change the public IP address of an instance a maximum of three times. Find the target instance to change the public IP address and then, in the Actions column, select More > Network and Security Group > Change Public IP. Note If the instance has existed for more than six hours, the Change Public IP option in the More drop-down menu is not available. A new public IP address is displayed as shown in the following figure. You can change the private IP of an ECS instance.